"Have you noticed that your neck appears swollen?" That's what the nurse practitioner asked about halfway through what I had assumed was a routine office visit. Soon after, I was swiftly catapulted into a long series of office visits that were anything but routine. There were ultrasounds, biopsies, consults with specialists, an invasive surgery, an overnight stay in the hospital, and eventually, the ok from my docs to go about living a normal life. That's when the medical bills started rolling in. Turns out I could kick thyroid cancer to the curb, but it wouldn't be cheap. Medical care is expensive, not just for me, but also for the one in four American adults under age 65 who have past-due medical bills, according to a recent study released by the Urban Institute. Still, knowledge is power. At least, it is according to the same Urban Institute study, which reported, "Adults with greater financial knowledge are less likely to have past-due medical debt." 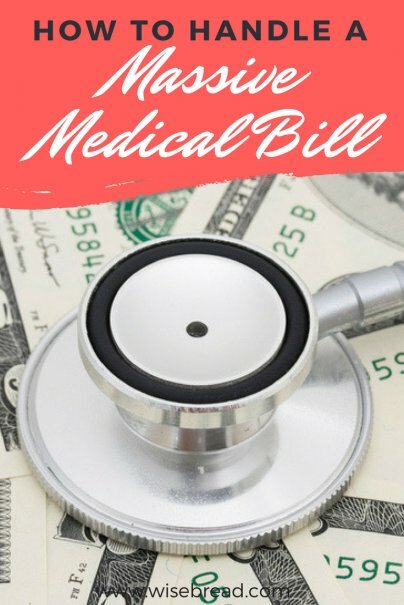 According to various sources, as many as eight in 10 medical bills contain some sort of error — sometimes even multiple errors. I'm not surprised. Mine sure did. When that first hospital bill arrived, it was for more than my annual deductible. A lot more. After suffering what felt like a small panic attack, I called my insurance company. As it turned out, they hadn't received a bill from the hospital. Instead, the hospital had billed me directly. It took a few frustrating phone calls, but the hospital ultimately fixed the mistake. Still, had the bill been for a less egregious amount, I may have overlooked the error and just paid it. I mean, how many of us scour the line items of those bills? "Sometimes, insurance companies or doctors' offices make mistakes that they don't realize," says financial coach Maggie Germano. "They may have simply miscoded something. It's up to you to follow up and make sure they aren't charging you when they shouldn't be." Looking over an itemized hospital bill is not for the weak of heart. Mine included shocking over-the-top expenses, like $27,000 for three hours in the operating room, $15,000 for an overnight stay in a recovery room, and $108 for a single dose of calcium. Those inflated fees are all part of an elaborate dance between health care providers and insurance giants. Insurance companies don't often pay the amount that gets printed on those statements. Instead, they use it as a jumping off point for reimbursement negotiations. Sadly, it's those without health care coverage who often get stuck in this line of medical bill crossfire. "Hospitals are always complaining that they're not reimbursed enough money from the health insurance companies, and therefore increase fees as high as possible," says Adria Gross, founder of MedWise Insurance Advocacy. Uninsured or underinsured patients typically don't have anyone behind the scenes who can negotiate those fees on their behalf. Instead, they have to advocate for themselves. Gross says that finding that number — before you call — can help you determine whether you've been overbilled so you can fight to correct the charges. If you still can't afford the bill, Germano suggests asking your doctor to set up a payment plan. "Most medical centers just want to get paid eventually, so they should work with you to make it easier for you to pay," she says. The key to this strategy is figuring out how much of the bill you can afford to pay each month. You'll likely be paying it for a while, so make sure you can commit to this amount for the long-term. "Get the agreement in writing, and make sure they send you a confirmation email or letter whenever you make a payment," warns Germano. Then, keep careful track of your payments along the way. "That will prevent them from accusing you of not paying what you owe," she adds. It will also ensure that the bill doesn't get sent to collections, which will damage your credit score. As Ben Franklin once wisely said, "An ounce of prevention is worth a pound of cure." That adage applies to your health, but also to what's in your pocketbook. Start planning now, so you'll be prepared when the unexpected strikes. And if it doesn't? Well, it never hurts to have a few extra bucks in the bank.